For some time now, the media and doctors have been touting the benefits of drinking red wine for their antioxidant effects. There is one grape that has brought much media attention over all the others, Tannat. This gets it’s name from it’s very strong “Tannins” coming from the skins of the grape. In fact most 100% Tannats coming from MADIRAN in Southwest France are not ready to drink for 10 years due to the very strong Tannic taste of the wines. However many producers in MADIRAN are now softening up the tannins by blending the grape with fruitier varietals such as Merlot, And Cabernet Franc. Why are doctors and the media so focused on this one grape? The secret to the healthful effects are compounds called procyanidins, and they come from the grape skins and Tannat Is LOADED with Procyanidins. Here’s the Attention Grabber about the people of the small village in France, Madiran. Despite diets heavy with cassoulet, foie gras and other foods full of artery clogging animal fat, the local male population lives very long lives. How Long?? The Average Man lives to be 97 years old!! And what wine do they drink? You got it, TANNAT! I just tasted and reviewed the 2011 Casa Magrez from Uruguay. 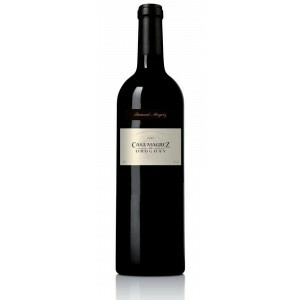 It contains 68% TANNAT, 16% Each Of Merlot And Cabernet Franc. Magrez encourages ripening of these grapes by covering the vines with a canvas material to protect from the rain. After an hour of breathing time (FOR THE WINE NOT ME), the wine was black in the glass just like the wines of MADIRAN. The Aromas of freshly brewed Espresso and dark black fruits were filling my nose and the entire area around me. On the palate the wine was dark, cassis and black plum fruits, great mid palate and a nice peppery finish to the wine. This was a wine that was screaming for Churrasco with Chimichurri Of course Skirt Steak is very fatty but who cares? The Procyanidins in the Tannat will clear out my arteries. Tannat was even mentioned in the famous book called “The Red Wine Diet” saying if you drink Tannat you will Live Longer. I guess there is truth to this as the Men In Madiran are ingesting high amounts of saturated fats daily and living to be almost 100 years old. Only Time will tell if the men of Uruguay will have this long life as well. In the meantime, TO NOT Drink TANNAT would be missing out on a chance to taste a unique grape with unique characteristics. The 2011 Casa Magrez from Uruguay is the perfect example. I love this wine. You can find it at a Bernard Magrez Shop in France or ask your local Wine Retailer if they have this great wine. Buy a case, throw out the Botox, Skip The Gym and Drink Tannat and live a long and healthy life! PreviousCelebrate LIFE, Not Just New Year’s Eve, With Bubbles! NextTAURASI….The BAROLO Of The South! !